As the political crisis over Brexit continues in Parliament, an exclusive new analysis by the Engineering Professors’ Council reveals that a cascade of effects – resulting simply from Brexit’s impact on engineering research – will deal a blow to the economy nationally and will hit certain regions even harder. Engineering is just one area of the research that goes on in higher education that would be affected by Brexit, but it accounts for a fifth of the research conducted in UK universities and the engineering sector generates a quarter of the country’s GDP. 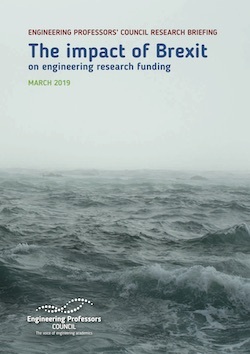 The EPC’s analysis looks at the impact of withdrawing this funding stream only, but it recognises the impact will be exacerbated by other cuts to EU research funding. Some communities will suffer more than others. 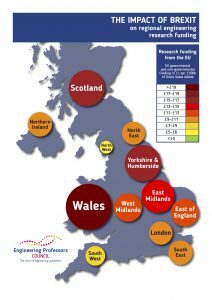 Hardest hit will be Wales, where in 2016/17 all chemical engineering research was EU-funded and where, relative to size of the regional economy, the loss of funding would be greatest. Yorkshire and Humberside, Scotland, and the East Midlands would be similarly badly affected, but no part of the country would escape some level of harm. The EPC represents the academic engineers in the UK, with 85 university engineering faculties as members comprising over 7,500 academic staff. Our primary purpose is to provide an influential voice and authoritative conduit through which engineering departments’ interests can be represented to key audiences such as funders, influencers, employers, professional bodies and Government. All branches of engineering are represented within the EPC’s membership. The EPC Research Briefing is available to download here. Additional EPC analysis of implications for different engineering disciplines and regions is available at here.